It started out innocently enough. Miss Priss needed (wanted?) 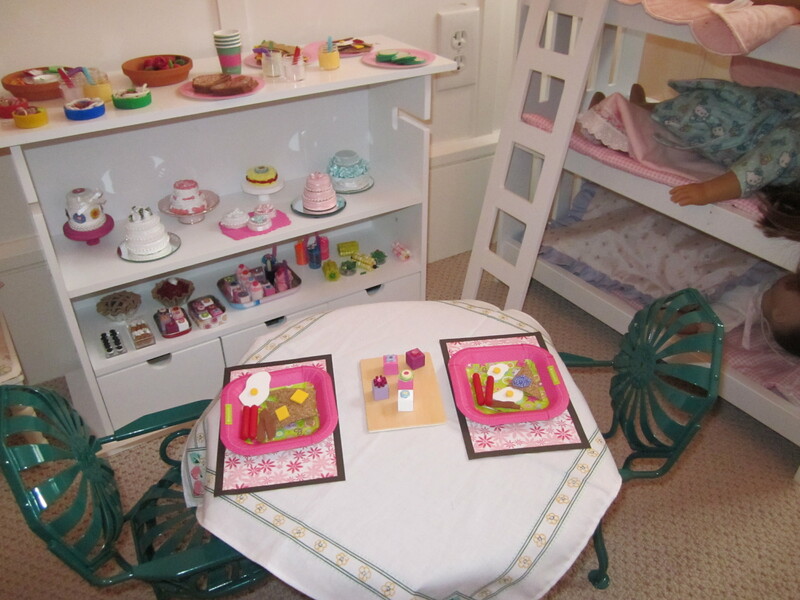 a shelf to hold all of the American Girl doll food we made at Christmas, so her doll restaurant would seem more authentic. I found a Recollections “Embellishment Organizer” for 50% off at Michael’s (A LOT of assembly required). 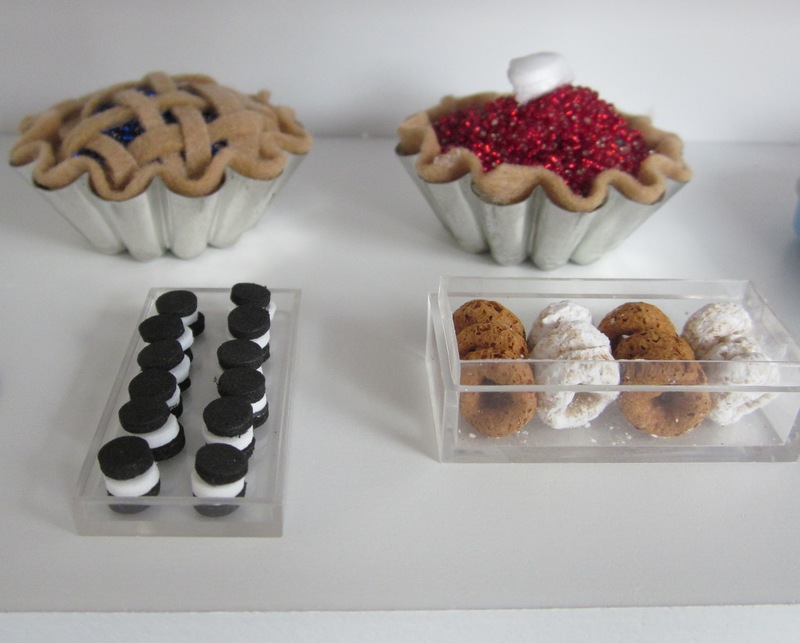 It really looked like a display at a bakery. Crafty obsessive idea brain immediately took over. 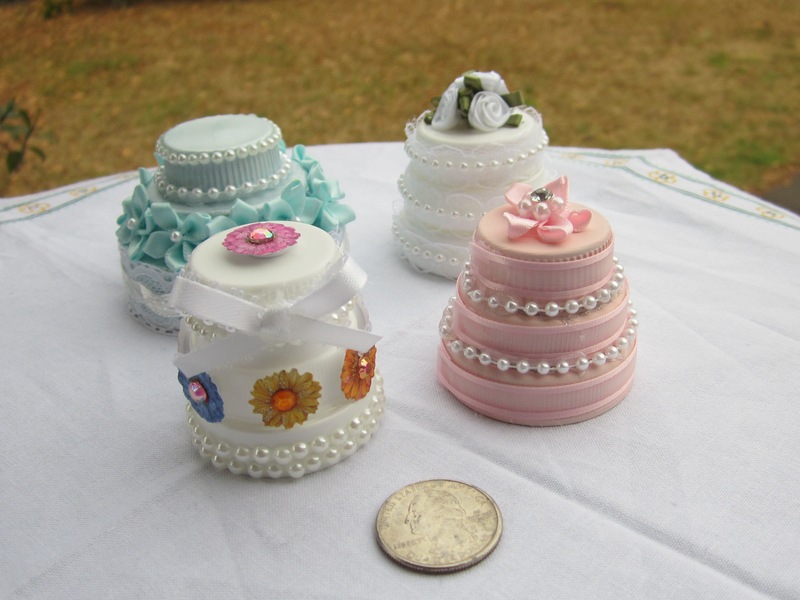 Hadn’t Sewing Sister made miniature cakes out of plastic bottle tops? 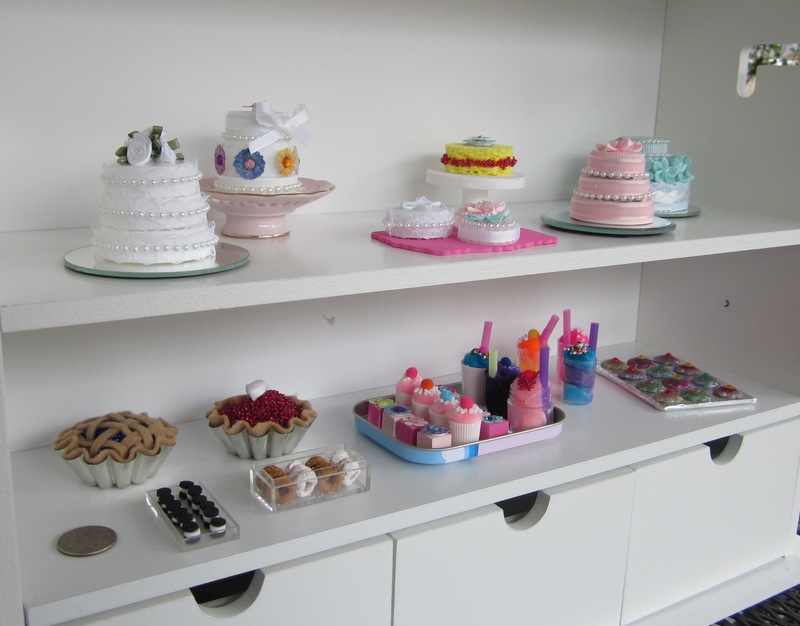 If I just picked up a few supplies, I bet I could make cakes. Did we really have enough American Girl doll food from Round One to fill the display? Perhaps not. And so, food production began again. Locate any and all plastic bottle caps. I used caps from anything I could get my hands on like water bottles, milk bottles, vitamin jars, juice bottles, and soda bottles. The more size variety you have, the better. 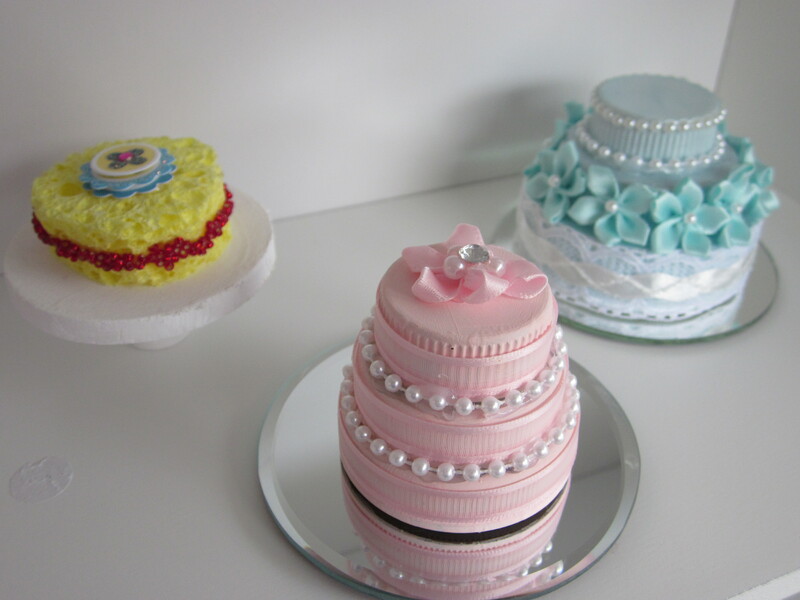 White plastic caps work the best, but I did use acrylic paint for the pale pink and pale blue cakes. It took about 3 coats of paint. If you have white bottle caps, no painting is required. I like 3 stacked bottle caps the best. Stack them in graduating sizes. Run a bead of hot glue around the edge of a bottle cap and press it onto the center of the top of the bottle cap that goes beneath. Repeat for all layers. 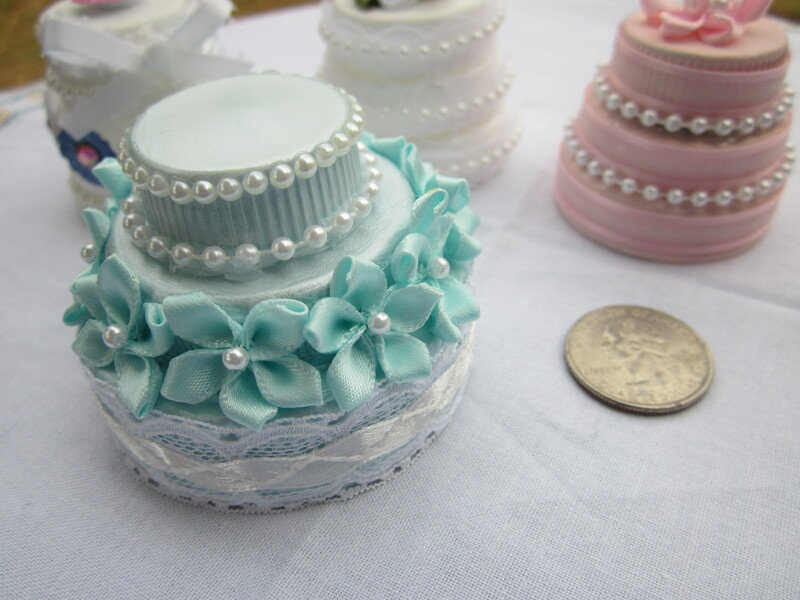 Add decoration with the hot glue gun. 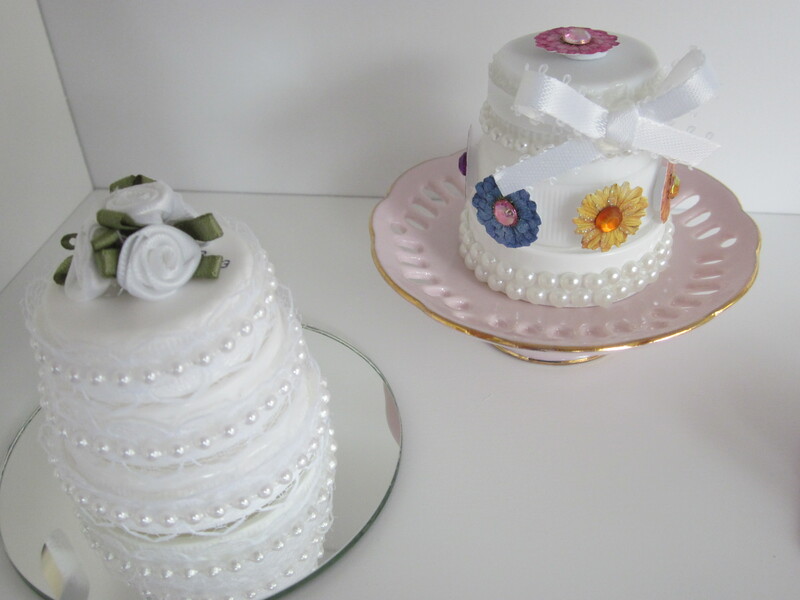 I used satin flowers, 3-D flower stickers, thin lacy ribbon, and strings of mini pearls. Collect twist off toothpaste caps. Thankfully, I had a stash of travel toothpaste tubes from the children’s last dental visit. My kids never put the lid back on the toothpaste tube anyway, so I did not think it mattered if I took the caps. Drop a blob of hot glue into the bottom of a toothpaste cap. Squish one 3/4″ pom pom into the cap. 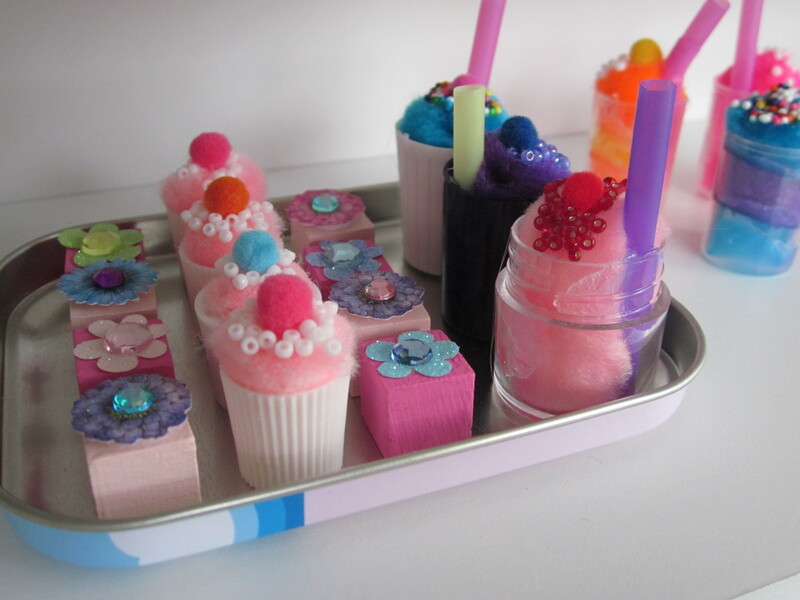 Smear a little Elmer’s glue around the top of the pom pom and sprinkle seed beads on the top. Add a mini 5 mm pom pom if desired. Taller, clear caps work the best for the milkshakes. The clear caps that cover the top of non-aerosol bug spray or suntan lotion are perfect. I also used small, clear bead jars. Cut a straw to the needed length to stand in the milkshake cup. Run a small bead of hot glue on the edge of the inside of the cup and attach the straw. Put a blob of hot glue at the bottom of the cup and press one 3/4″ pom pom to the bottom. Add a blob of hot glue to the top of the pom pom and press another pom on top. Try to avoid getting any hot glue on the edge of the cup because it looks smeary from the outside. Repeat one more time with a third pom pom. 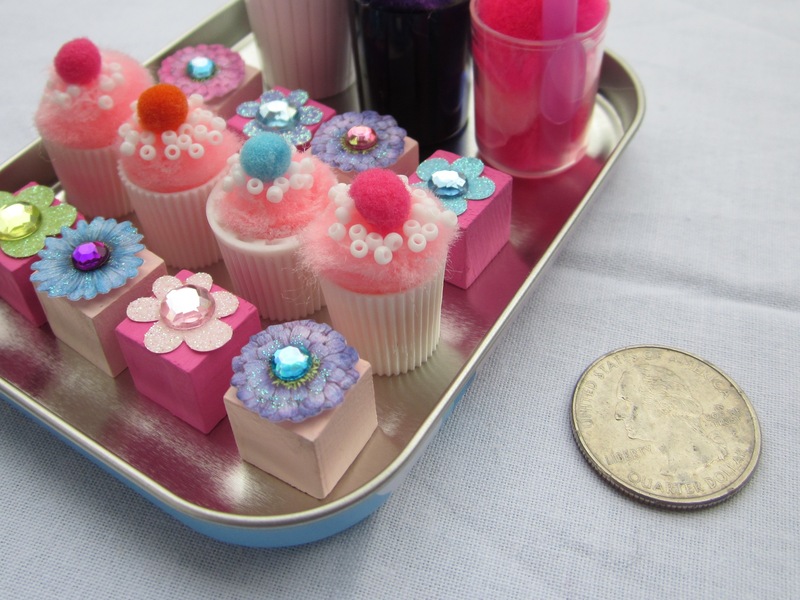 Smear a little Elmer’s glue around the top of the pom pom and sprinkle seed beads on the top. 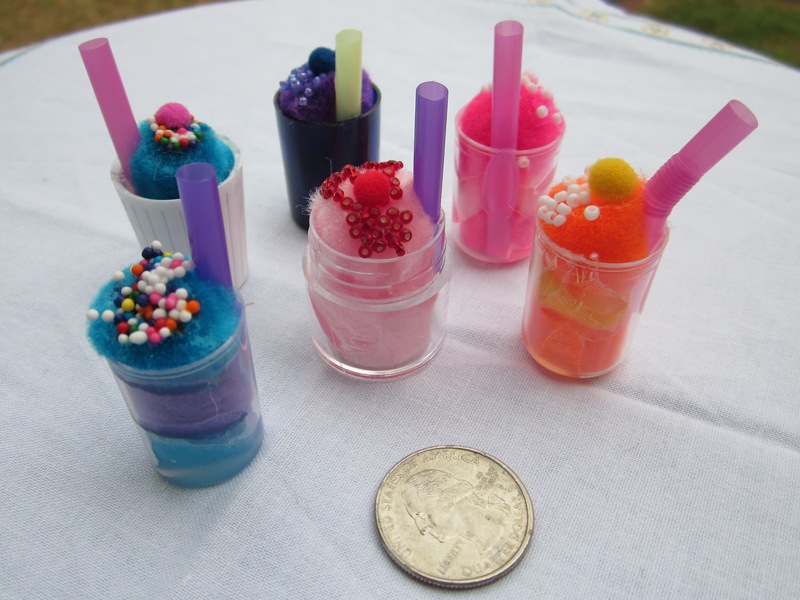 I used rainbow nonpareils sprinkles on a few of the milkshakes too. Put a spoonful of powdered sugar in a small Ziploc bag. Add Cheerios and shake. Put a spoonful of cinnamon in a small Ziploc bag. Add Cheerios and shake. Remove Cheerios from the bags. 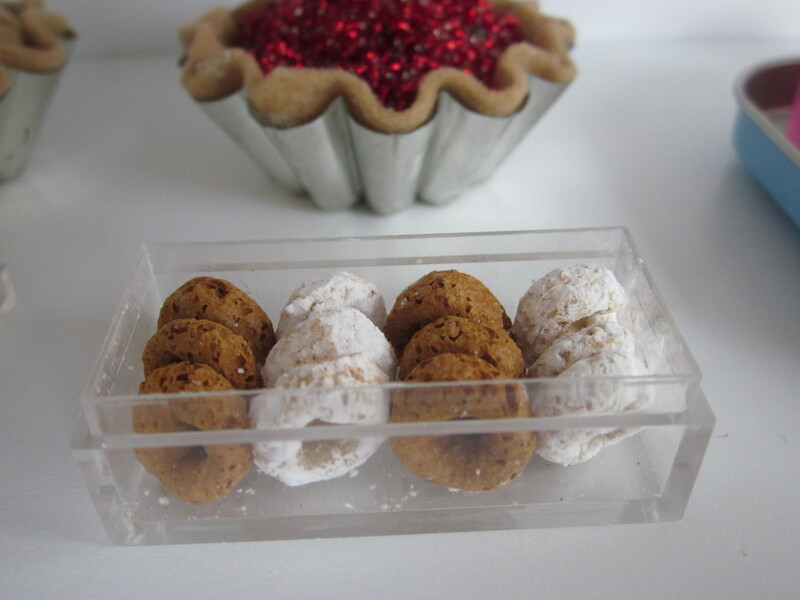 You may need to brush excess cinnamon and powdered sugar from the Cheerio. Using a round hole puncher, punch a ton of black and white circles from foam sheet. With glue dots, build Oreo cookies. 2 black circles on the outside, one white circle in the center. 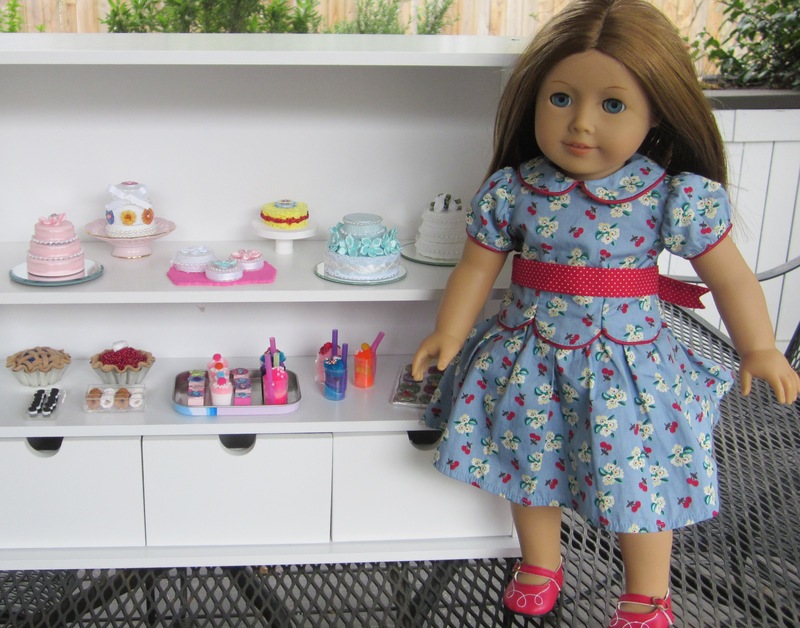 Visit the original American Girl Buffet Post for directions. 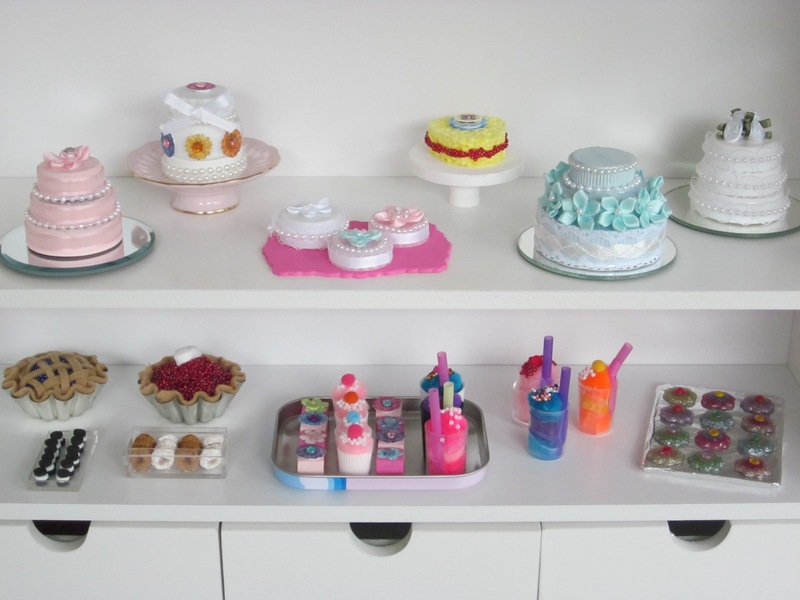 I have put the bakery display in Miss Priss’ room, although, I am not entirely comfortable with her actually playing with the doll food. It looked so perfect for a few short hours sitting on the shelf, untouched by little hands. This is how Miss Priss has it set up in her room. Simply fabulous! I’ve been saving caps from everything now I have another great idea to use them for. Have fun! It’s easy to go crazy once you start. I did something a little different for the milkshakes. I used clear caps from my perfume and when I was cleaning the perfume out, I used toilet paper. In my little creative mind, it looked like cream so I pushed it all the way down. Now all I have to do is add the cherry and straw. these crafts are for my My Life dolls. Now I can play whenever I want. BTW I plan on using bottle caps for the cakes as soon as my parents and my brother wake up. I have also been straining to find no sew doll crafts even though I have a sewing machine. When I got it for my birthday last year, I de threaded it so now I can’t re thread it so it’s useless now. Can you have your mom help you re-thread your machine? You can do a bunch of easy things with just a straight stitch. Fabric glue works well if you do not have a machine you can use, though. Lucky daughter to have a mom like you! Well that is the “teacher” in you…. I have been a retired teacher for almost 2 years and am just now giving up some of my control issues! Some. These are so precious. I have to go make some now and I’m 62! !